This information details where height adjustable tables are located, heights of other tables and other relevant information. Height adjustable table in the silent study area. 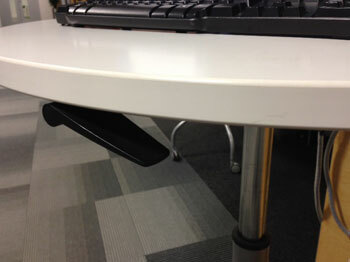 Assistive technology height adjustable table. Floor 1 and 2 in soft seating areas. 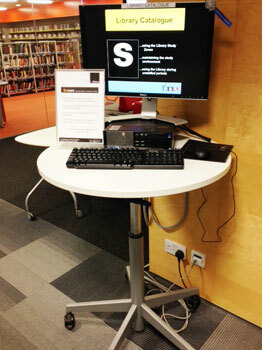 A number of library catalogue computers positioned around the Library are on height adjustable tables. We have a number of study tables on Floors 1 and 2 that can be adjusted and fixed permanently to a different height – please let us know this would be helpful. If you require a height adjustable table on a regular basis, in a particular part of the Library, then please let a member of the Library staff know and we will do our best to find space. We offer a choice of types of chair around the Library including many height and tilt adjustable chairs. In addition we have fixed height chairs and on Floors 1 & 2 we have casual soft seating areas. Please ask a member of staff if you require any assistance whilst using the Library.